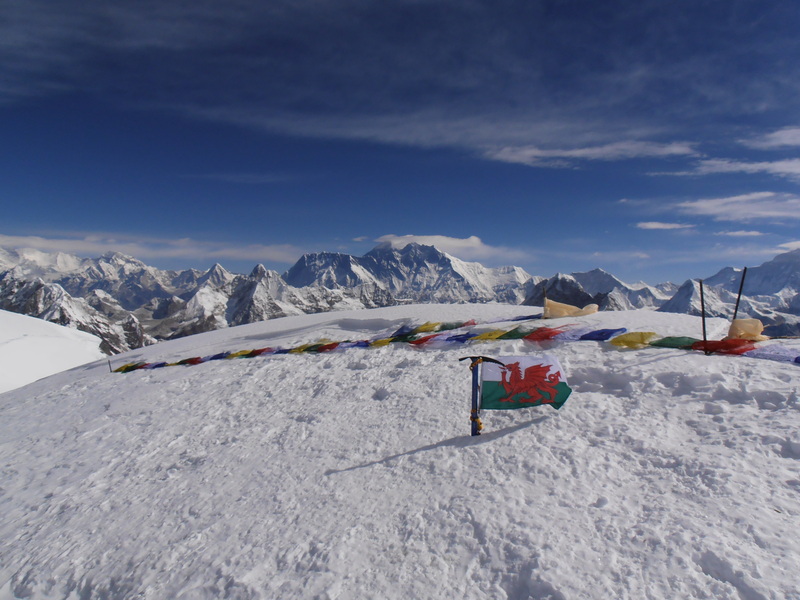 Everest as a backdrop for the summit flags. An ascent of Mera Peak starting and finishing in Lukla. 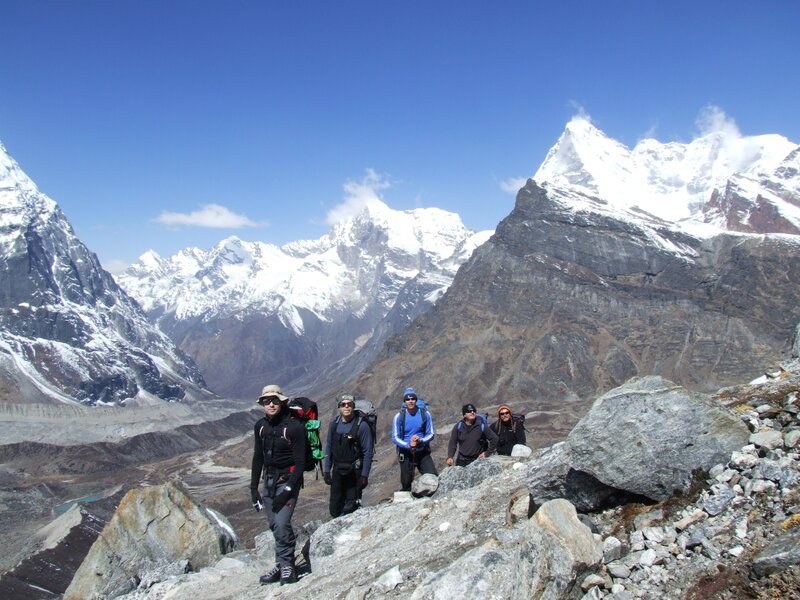 The Island Boys would extend their trip by crossing the Amphu Lhasa pass, summiting Island Peak and descending by the usual Everest Base Camp route. Dawa Tashi and Tenzee. Lead guide and guide. Nigel and Rob, Tent mates. Gerwyn, Gareth, Irish Steve and Byron. The Island Boys. Mark, Ade and Dave. The Wilson Boys. Gillian, occasionally known as Janine or even ‘J9’. A really early start, we were up by 0400hrs and in breakfast by 0430. Yeucch! It was still dark as we headed to the airport, but by the time we had booked in, the sun was up. Our plane was a 20 seater Twin Otter, with just enough room to squeeze between the seats. I was told to go for a left hand side if I could and was over the moon when I was able to grab one on the left. Bad news though, all my photos were through the spinning propeller blades. Good views though! The plane is so small, you can actually look over the pilots shoulders. One of our team had landed at Lukla before and pointed out the airstrip. FECK!! I kid you not, it’s like landing in the school yard of a small town junior school. The runway goes up hill and ends in a big stone wall in the middle of the village. It’s exciting! Until now, I had just been in my ‘T’ shirt, but it was a lot colder here than it had been in Kathmandu. It was fully day time now, but we were in the shadow of the mountains, with the smell of wood-smoke, lots of people milling around, and this fantastic snow clad peak sitting across the valley, like a postcard view. We walked a few minutes up to the Tara lodge and then Old Steve our guide at first bizarrely decided we would call it a day then and continue on tomorrow, but then relented and announced we would move on that morning after all. I was quite glad, as I didn’t want to be a day behind already. 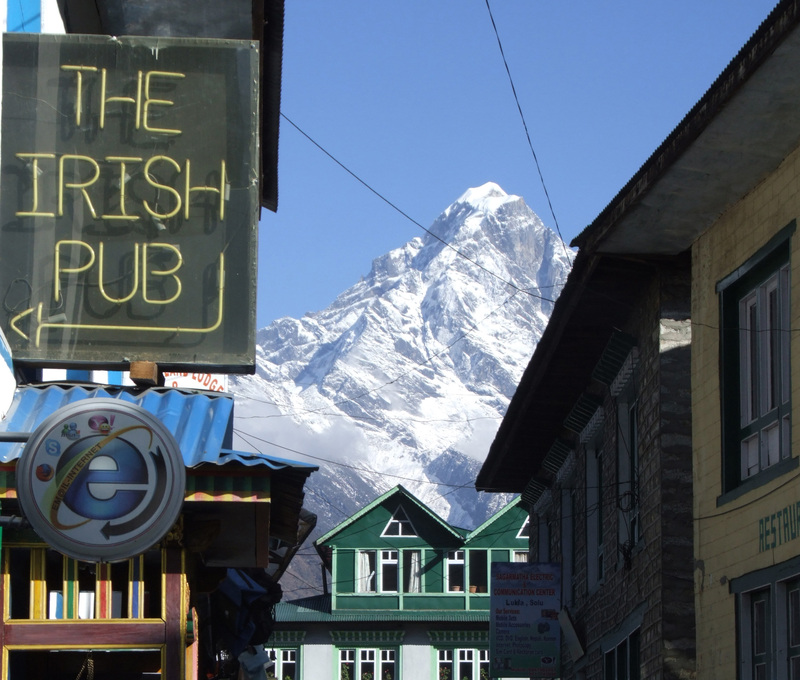 Lukla is a pretty chilled out place and has a number of shops, bars and cafes. When the sun was shining, it was positively warm. Unfortunately 3 of the bags were delayed and we had to wait until 1000hrs until we could set off. The worst thing was we didn’t know when we would go, so had to just hang about. Eventually off we set. However no sooner had we started, but within 5 minutes we had to stop again! The head porter had forgotten to get the permits stamped. Eventually, we set off downhill, walking through little villages for almost 2 hours. Sometimes there were mule trains passing us, and once a herd of yaks. Some of the porters passing by must have been carrying well over 100 kilos on their backs. We had a lovely lunch sitting next to a river, and then started the slog back uphill as high as we had dropped down in the first place. Including our lunch stop and a few short breaks, we walked for around 5 ½ hours that day. Our campsite was behind a tea house, and whilst we slept in tents, we would take our meals inside the house. We were in bed by 2100hrs, all tired from the early start and of course the first day is always a bit tough until you get into your rhythm. The evening was cold, but the day had been great. Fantastic views and such an exhilarating flight. After marvelling at a beautiful star filled night, I slept like I’d earned it. It was a cold start to the morning until the sun got onto us. A cup of tea served at the tent, then a bowl to wash in. A queue for the outside toilet and a welcome breakfast of porridge and omelettes. That would be the format every morning now until summit day. We started off at 0800 and after a pleasant path that contoured around to the next flank of the valley, we set off up a steep hill on a hair-pinned footpath. The views north up the Dudh Khosi valley and onto the nearby snowy peaks were stunning and I got my first ever direct view of Cho Oyu. A steep and long descent took us into the next valley and we dropped down to a lovely picnic spot near a gently gurgling stream. Waiting for us was hot tea and a cooked meal. By now, it was hot sunshine and I actually dozed off for about 10 minutes after food. But, after every downhill section, you’ve guessed it, back up we go! Following lunch, we steadily climbed back up to just below the head of the valley .It took us over 3 hours and we regained around 300 metres height. The valley was quite pretty with terraced fields filling a lot of the hills. We finally reached our campsite after about 7 ½ hrs walking. It was a little mountain village with loads of prayer flags and Mani walls. There’s even a big Buddhist stupa. The plan is that tomorrow we will visit a monastery that is set up above the village, and it’s the presence of this Ghompa that probably accounts for all the religious paraphernalia that is evident. An early visit to Pangkonkma monastery started our day. The monks were very young, mainly prepubescent boys, but they seemed very keen for us to see them at their best. My photos won’t do it justice inside the temple as it’s been so cold overnight my batteries are dead. It will be into the sleeping bag with them from now on! We moved uphill from the monastery and crossed the La into the Hinku valley. Although it’s many days away, it’s the head of this valley that will take us to our final destination. Our original plan had been to drop right down to the valley floor and then flog our way back up the other side and follow that ridgeline to gain a steady altitude profile. 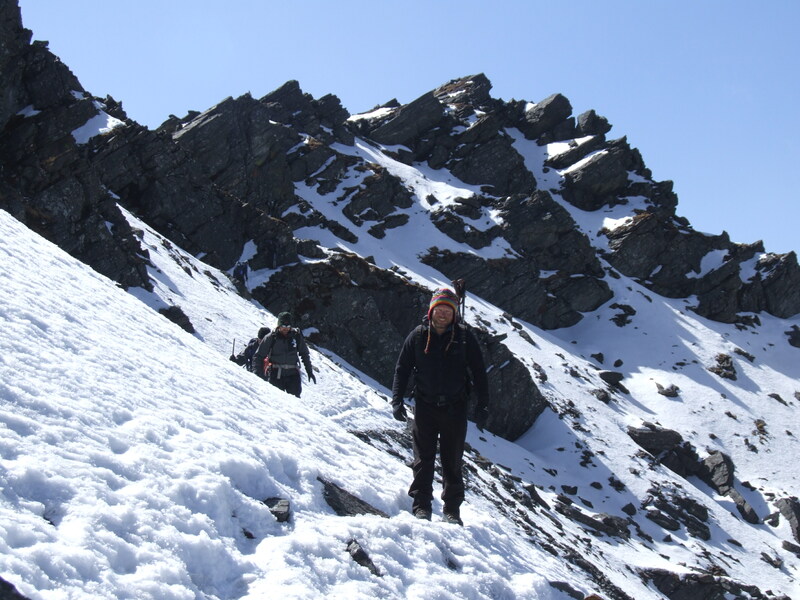 Unfortunately, the snow over there was deep and powdery and would have been too difficult for our porters with their loads. We opted instead to stay this side of the river and use a recently reopened track through the forest. This did mean though that we would pass right by our head porters house and stop there for our lunch. When we arrived there, it was a simple building, but set in a stunning location on a spur of the mountain looking over the valley floor way below us. The lunch was equally as good and again it was a great way to spend some time, lying there in the hot sun. We continued on undulating paths that stayed high on the flanks of the valley. Small side valleys with streams cut across our way and we cross grained over these to get to our evening rest stop. It was a single roomed tea house with a smoky open fire. There was no chimney, so the smoke pooled in the eves and eventually seeped out through cracks in the stonework and between the rough wooden roof tiling. There was no electricity and the water came from a hose pipe that collects water directly from the stream further uphill. We camped outside and around us were a few small farmsteads, all nestled on a sloping field set in the deep valley. The views though were stunning. All around us were Magnolia trees with their big white flowers. One flank of the side valley was covered in pine trees, the other in deciduous interspersed with rhododendrons. The mountain rose up steeply above the camp and there were tendrils of mist or cloud rolling down over the top like the streams of a waterfall. We had had an easy day of it, but had still walked for 7 ½ hours with breaks. The day wasn’t over yet though. As dusk settled on us, we realised that there were literally thousands of ladybirds everywhere. They were in the tents, crawling over necks, walking on notebooks and landing in camera bags. They were bloody everywhere! But even that wasn’t the end of the night. As usual, we were all in bed early, and I dozed off after listening to my iPod for a while. Sometime later, with the campsite in complete darkness, there wasn’t a sound to be heard. Until…..! I was dragged from my sleep by a real blood curdling ear piercing scream. This was quickly followed up by Gillian screaming for help like the devil himself was eating her toes! The whole camp went bananas with people scurrying to get out of their bags and go to the rescue. Porters were quickly outside and shouting like crazy trying to find out what the problem was. Then stunned silence as Gillian calmly called out, “It’s okay honest! I’m fine.” She’d only had a bloody nightmare hadn’t she? It might have been ‘fine’ for her, but most of the rest of us had either pee’d in our pants or had heart rates going like a stream train!! The next morning she couldn’t even remember what she had been dreaming about. We started in gorgeous sunshine and were straight up a steep hill to take us over a spur as we climbed further up the valley. 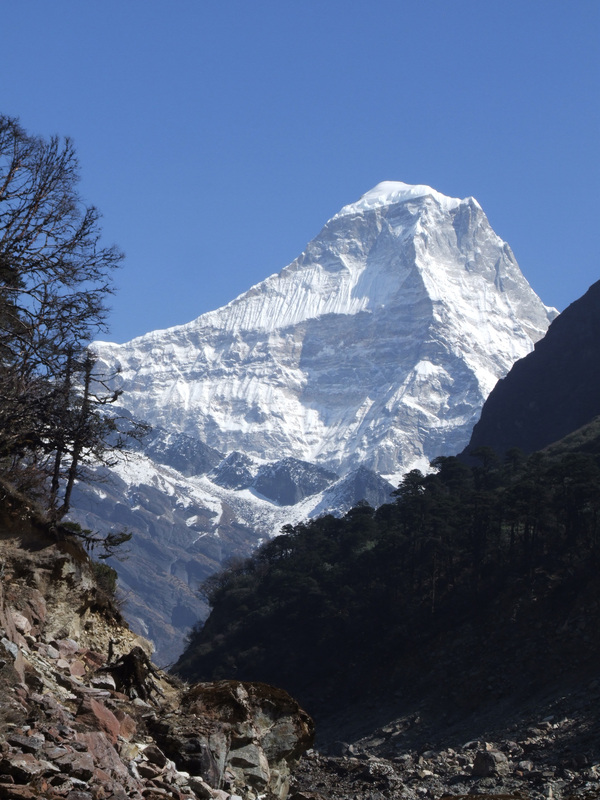 We had our first views of Mera Peak, still some distance away, but shining brightly in the morning sun. We had rhododendron, magnolia, warm sun and fantastic views of the snowy peaks; a stunning situation all round. It was simply beautiful. It turned out to be a really long day, with 3 big ridges to cross and some really steep ground. We took our lunch at a stream with water coursing through the rocks and settling in what looked to be brilliant bathing pools. In reality though, they would be freezing and you wouldn’t want to spend too long in the water! The next ridge took us over the steepest ground yet., The locals are rebuilding a path, but it is nowhere near finished yet. When I say steep, I mean that if you fell, you would bounce for a few hundred feet until you stopped. That steep! A handrail rope had been set up to cross a section that passed over steep almost vertical grass and mud, then the path levelled off and crossed a small outcrop of rock onto which had been built a projecting path supported by poles sticking from the rock face surmounted with planks and logs. There were 1 or 2 in the party that looked more than a little nervous! The final challenge was to cross a quite fast flowing stream using a giant log that had fallen like a bridge. It was easily big enough to feature in a Tarzan or King Kong film! A new section of path on the western side of the Hinku valley. Our campsite for the night was way off the beaten track here. The tents were pitched wherever they could be squeezed between boulders and the remaining stumps of bamboo they had been cutting back. They were still digging out pitches as we arrived, and as it started to rain I couldn’t decide whether it reminded me of trench warfare in the Somme, or Vietnam with it’s punji stick booby traps. Still, it had been a good day and our concerns that the route may have been impassable were not borne out. We set off at 0800 and were told this would be the last day of up and down on the route. After this, paths would generally be pretty much in one direction. UP! The terrain was quite like that of the preceding day, heavily forested, with undulating paths dappled in the sun. We passed a number of very pretty waterfalls and many stands of rhododendron and eventually settled down to lunch by yet another idyllic stream. We didn’t stop too long though as the weather was turning and it was threatening rain. We had a repeat of the morning, with another ridge line to cross, but all the while we were steadily gaining altitude as the valley crept higher into the mountains. Just before we reached camp, we finally dropped down into the valley floor and followed the path as it meandered parallel to the main river. But what a difference between two nights campsites! 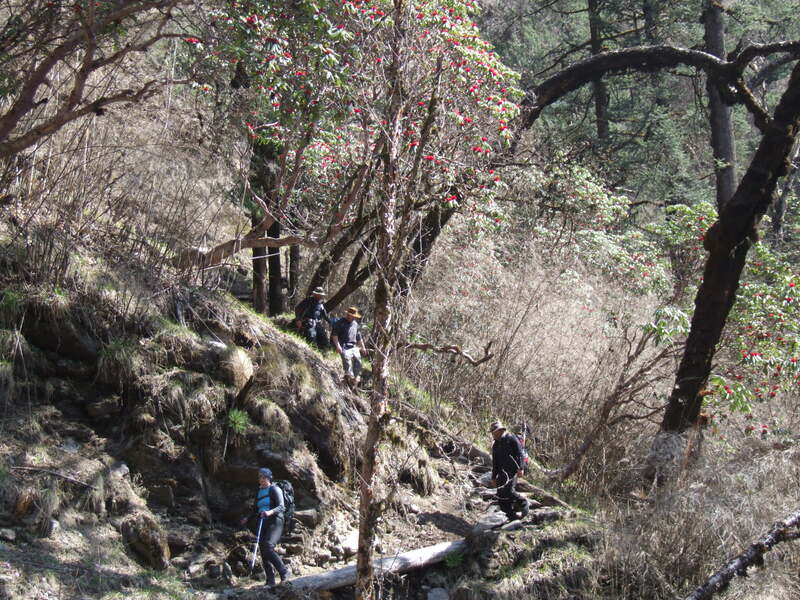 Khote is a little village of stone built lodges that has sprung up to service the trekking industry. There’s an impressive waterfall in view from the village square, and the tea houses all have wood burning stoves that the landlord will light for a fee. There are prayer flags everywhere and best of all, you camp on a flat grassed area rather than the same as last night’s battlefield conditions. When the clouds break, you get tantalising views of Mera Peak and it’s decidedly colder here as the sun is blocked out of the deep, steep sided valley. Our evening meal was served with a flourish and we had the best buffalo burgers I’d tasted in a long while. I had slept like a baby and consequently missed Gillian’s second round of nightmare screaming. Mind you, apparently nobody else bothered to dash out to her rescue this time either. Kyashar, also known as Peak 49. Today’s walking is a real change of scenery. No more buried in forest on the steep flanks of the valley. Now we were following the valley floor towards it’s head. All around us were snowy peaks that rear up into the sky. On our way, we stopped at a little monastery and had a good luck blessing from the lama there. Our campsite was again alongside a tea house and as the dusk settled, we got great views onto the Mera La, where we will head in a few days time. 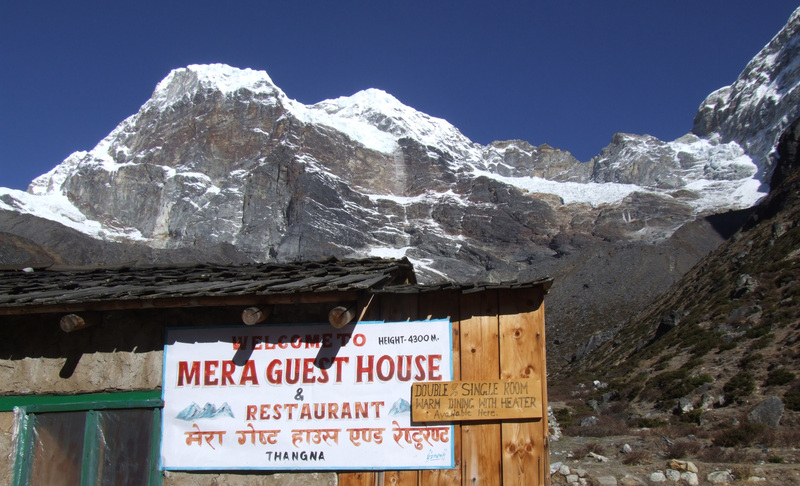 Tangnag is at 4,300 metres and we stayed here for a few nights to get some acclimatisation in. Today was billed as a rest day, but I was awake early as my thermarest had sprung a leak. I’m not the only one either, there were 3 leaks between 10 of us, which is a bit odd. When the sun came over the nearby peaks, it was a gorgeous, sunny, clear morning. Most of us took the chance to get a bucket shower and do a bit of laundry. Bliss! 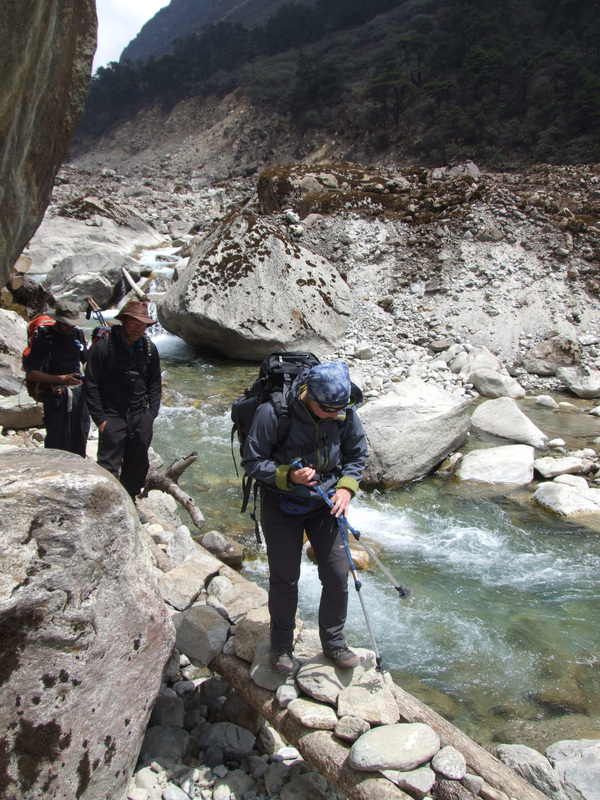 Again the views of the Mera La were impressive and we all took it easy for the morning. In the afternoon, we are all obliged to show our competence or get some practice using ascenders on the fixed ropes. However, the weather turned quite quickly and we got our first taste of the weather pattern that would be repeated on many days. The afternoon was filled with a burst of stormy, sleety hailstones and snow. It cleared up later, but the whole area was shrouded in low boiling cloud that flowed up the valley like smoke. Way into the night, the sky was completely clear again and it was like a blanket of stars. I’m lucky that my night time pee was timed to coincide with a really bright meteor that flashed brightly across the sky further down the valley. Then later again in the depths of the night, I could hear the wind roaring up the valley toward us like a jet engine. You can hear it coming as if it’s a physical solid thing. Then it hits the tent flattening it toward your face before bursting on and further up. It was really quite fun listening for the next big gust and then waiting for it to hit the tent. Not so much fun for one poor villager though! He had to get up in the morning and figure out how he was going to replace half of his roof that had been torn off. Another leisurely start to the day today with a cup of tea in bed. As the sun crawled over the roof of the tent, it quickly turned from cosy to hot. About 0810hrs we set off up a ridge that sits above the camp, so we get some altitude and prepare our bodies for what lies ahead. The first part of the walk actually reminded me off the Brecon Beacons in terms of the terrain underfoot, but of course it’s surrounded by huge mountains with hanging glaciers and the occasional Eagle soaring high above us. As we got higher on the ridge, the strong wind blowing up the valley hit us, and boy was it cold! We eventually reached the snow line and the wind got even stronger. The ridge ends in a jumble of boulders and cliffs before it joins the main mountain range, and that was where we turned around for the day. We’d got to around 5,150 high and for over half the team, that was the highest they’d ever been. After a few obligatory team pictures, we headed back down and were in camp by 1245. We’d ascended around 800 metres and walked for about 4 ½ hours. Not bad for what we’d been referring to as a rest day! Of course, to redress the balance, a few of us retired to our tents that afternoon for a little snooze. Well, it was a holiday after all. Of course, not even the best snooze can be allowed to get in the way of afternoon tea. Gerwyn, Gareth, Irish Steve and I had gained the reputation as the Top Tea Heads. We guzzled pints of the stuff between us in our bid for acclimatisation. As we sat in the tea house tackling our third or fourth cup each, we heard the locals shouting and calling outside and went out to join them. On the flanks of the mountain to our east, tons of ice had fallen from a high serac and a huge cloud of snow and powdered ice was billowing into the air. Behind it a strong stream of snow poured down through the gulleys and would have swept away anything in it’s path. It was an awesome beauty to watch and a powerful reminder that we were a long way from civilisation and the rescue services here. Grrrr! What? Nigel’s angry? What could he be angry about? He’s sitting in a tent at Khare, he’s got a tasty dinner in his belly, and he’s downed more than a few cups of tea. What could possibly be wrong? The story of the Pee bottle, that’s what! At altitude, you must drink a lot to aid with your acclimatisation. The down side is, you then pee a lot. When it’s minus 10 or 20 celsius at night, or it’s snowing or similar, it’s easier to pee into a bottle than battle the elements. My pee bottle was only a second hand Gator Aid bottle wrapped in gaffer tape. I didn’t even buy the drink, the empty bottle was given to me. It was functional but of no monetary value. When we were at Pankgkongma I had thought I might start using it and had put it under the tent’s flysheet. I didn’t need it and forgot to pack it up the next morning. At the next camp I realised it was missing and asked Steve the guide if he could enquire about what they’d done with it. “They threw it away because they thought it was rubbish.” was the answer I got. Okay, I wasn’t going to die in a ditch over it, but it was now getting much colder in the nights and I needed a pee bottle. Just before we left Tangnag, I bought a new pee bottle. All that was available was a nalgene bottle for an outrageous 500 rupees. But needs must, and that’s what I bought. We left the camp and took a little detour to the moraine of Sabai Tsho Lake at the head of the valley. The moraine is cleaved by a huge rent that has allowed much of the lake to drain out. Early in the morning hours of an ordinary day in September 1998, an earth quake caused a large piece of the glacier hanging steeply above to fall into the lake some 200 – 400 m lower. One estimate puts the falling ice fall as being 100 metres wide, 10 metres thick and a colossal 300 metres high. The resulting tidal wave caused a hole in the dam, which was quickly widened by the outpouring flood waters. The valley floor was scoured clean of vegetation and covered in massive boulders and tonnes of gravel from the disintegrating moraine. The flood poured past the village just 1 kilometre away and continued for some 20 hours or so. In Tangnag, some houses were swept away and three yaks were killed. Amazingly, no other casualties were reported. This huge face was responsible for the huge flood that followed the dam breach. From the Lake, we made our way up through the lovely meadows at Dig Kharka and stopped just before we got into Khare. We were served hot juice and to my surprise, I saw the sirdar pouring himself a drink out of my pee bottle! Imagine his surprise when I told him what it was!! I was annoyed that my bottle had been nicked, but secretly a little amused with his green face and by the way he threw the drink out as if it was battery acid. However, any amusement subsided back into anger when one of the young porters returned and tried to hide the bottle under a rock overhang as he had not realised we’d seen it. Guilty! So, I got my bottle back and sold the new one at cost price to Dave, who wanted an extra bottle. But I digress! You want to hear about today’s expeditioning don’t you? We set off from our camp about 0800 as usual. It was lovely sunny weather as we inched our way up the mountain. We visited the moraine as I’ve described, and whilst pondering on the luck that had saved the locals, we crossed the Dig Kharka meadows. The path turned uphill again on the final approaches into Khare and as we arrived, I got the overall impression that it was like a frontier town from the old days of the wild west. In many ways it is a frontier town. It’s the last bastion of civilisation before you move above the snowline. Khare and below have food, plant life and buildings. The mountains above have nothing but snow, ice, rock and thin air. When the clouds break, it’s quite sunny, but mixed in with that is the gentle but persistent patter of little hailstones. You can just see the final summit cone of our destination peaking up above the horizon, but it actually just looks like an added on wart from this angle as opposed to a beautiful proud summit. All was well with the team and most of us were enjoying ourselves and feeling confident. We had another rest day planned, but although it wouldn’t be too taxing, we wouldn’t actually be resting all day. There is a big mast with prayer flags high on a ridge above the village, so we set off fairly late and took two hours to walk there and back. The views again are as always stunning. You can see back down the valley to Tangnag, north to mountains I can’t even name, and of course there are views onto Mera peak. It’s an easy day, and we walked a good few hundred metres higher than the flags to the top of the ridge. Back at camp, we fixed our bags for the final few days before the summit. It’s into big boots now and we will be permanently above the snow line. We needed to ditch as much kit as we could and only carry anything that we really will need. The down side of a short day is you can run out of things to do. It gets so cold that it’s easy to retire to your sleeping bag and get really long nights in bed. The down side for me though, is that I didn’t get such a good sleep. The lunacy of night time screaming has resumed and as I’m barely asleep, it easily wakens me. I hear some puzzled and frenzied comments from other camps, but we’re all used to it now and don’t even turn a hair when it happens. It’s a really cold night and yet again my thermarest has sprung a leak. I know others are still having problems and the concensus of our opinion is that our night in the newly chopped down bamboo groves has probably embedded tiny splinters into our kit, which then subsequently puncture the mattresses every now and again. I was cold, bored, fed up and uncomfortable. I wanted the morning to arrive, so the sun would warm me through, but I also want it to stay night so I can go back to sleep. It’s not a good feeling. I think I fell asleep for a short while just before breakfast, or did I just dream I was sleeping? I’m still cold over breakfast, to the extent where I’m really slow getting my kit ready and I actually went and bought some new down mittens. Yesterday’s strong feelings of impending success have been replaced by a fatigue and worry about the cold that chills me to the bone both physically and spiritually. I don’t want to start walking as I’m so cold, but of course I know the only thing that will warm me up is to start walking! So, wind your neck in Lewis and get on with it. It’s why you came here, after all. I suppose I knew this would happen all along really, but luckily as soon as I got going and eventually we got into the sun, the whole world felt like a better place. Gone were the feelings that I should be by the beach, to be replaced by my usual love and awe for the splendid mountain scenery around me. Our path was steep from the outset and we reached the snow line soon after leaving camp. The moraine between the glaciers edge and the lower moorland was steep and undulating, with occasional patches of frozen scree and boulders. We donned our crampons for a steep snow slope, but didn’t need to rope up yet. The porters were still carrying quite big loads but were no longer able to just blast past us as if they were carrying a feather pillow or two. Upon reaching the Mera glacier itself, the terrain flattened right out, but still undulated a little between little hillocks and deep crevaces. We were now at 5,400 metres and although the going was easy, nothing could be taken at a rush. The views toward high camp and the eventual summit were as ever, fanbloodytastic! I hesitate to say ‘out of this world’ as they were very much part of the planet. However, they are up near the roofline as opposed to anywhere near the ground floor. As we reached the far side of the pass, we dropped own a few hundred metres or so into the Hongu valley. It’s a high valley with no crops and no teahouses. It’s just simply too high for people to spend any length of time there. Our campsite was already snow bound, and the tents were pitched on little soggy gravel beds. Because it was sunny, there was a lot of melting snow and loads of tiny streams and rivulets criss-crossed the camp. It had taken us just 4 hours to get here, but it was like we were in another country. We had crossed that frontier. Lunch was pleasant enough, but even as we were eating, the cloud was coming over. I had to fix my thermarest or face some very unpleasant, possibly “summit denying” cold nights. First I had to coat the thermarest in soapy water so I could trace the leak. I found it, but my pen wouldn’t mark the surface so I had to balance a small pebble where I was going to fix the patch. However, every time I turned around to pick up the patching kit, the mat would blow away and I’d have to start again. By now I was getting really cold and the snow was starting to become a real issue for me. Thank God Rob came out to help me as I would still be there now, weeks later, frozen to the spot. Between us we relocated the hole and got it marked. We took the mat back to the shelter of our tent, but where I had washed the soap off was now freezing over with a little sheen of ice. In the end, the only way to dry it out was to lie on it and let my body heat defrost it and then get it dry. Thanks Rob, you’re a star and I don’t know if I thanked you enough at the time. I had really been starting to slip toward hypothermia while outside and was finally back in the warmth and feeling a lot safer. It was a salutary reminder of how the little things can start to add up and things can then plummet to where they go badly wrong. The weather stayed bad all afternoon and the staff did a sterling job bringing everyone’s evening meals to the tent so we could eat with some semblance of warmth. The snow has fallen slowly but steadily and with all afternoon, evening and night to contemplate it, I started to worry that the weather might scupper our plans. Our first view into the Hongu valley. I woke to bright sun. 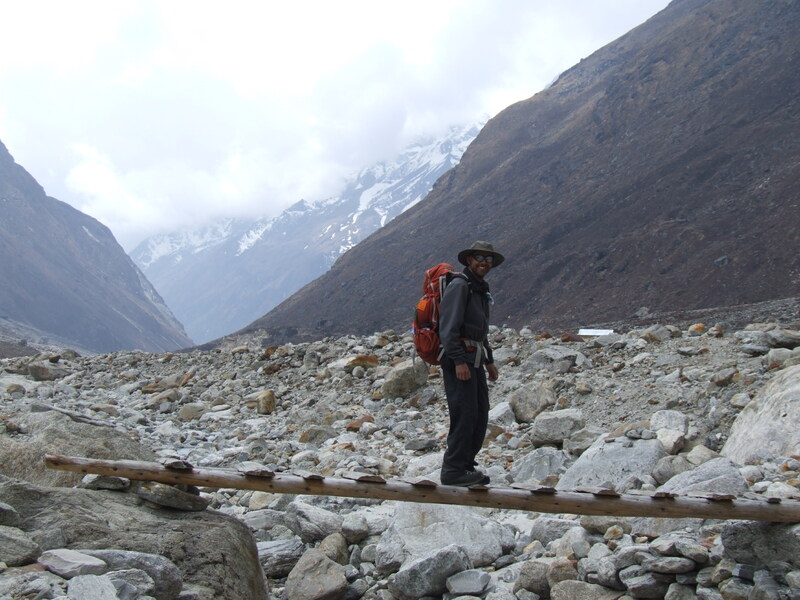 Because we’d crossed the Mera La, we were now the other side of the ridge and weren’t getting the morning shadows. It was bloody lovely! My rucksack strap had frozen solid into the ground as it must have sat in one of those rivulets, which was now a mini glacier as opposed to a stream. We scrambled up the mixed scree and snow to reach the glacier proper where we strapped our crampons back on for the journey to our highest camp. 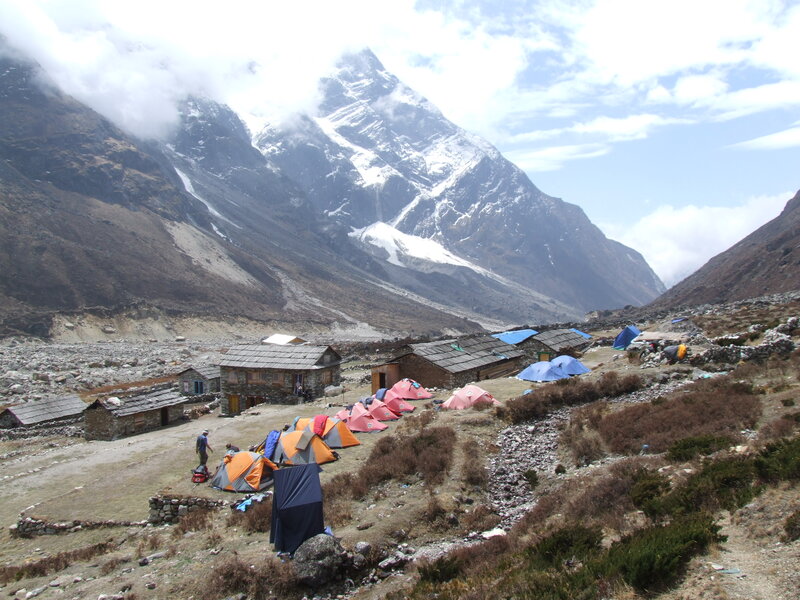 Some of the team will be going on to Island Peak afterwards, and their tents remain at the camp. So when we reached high camp 3 of us squeezed in where there are normally 2. Oh well, at least it was warmer! The walk was relatively easy in the way that it was not at all technical, but the altitude was telling on everyone. We were moving up to 5,800 metres, which is a full kilometre higher than Mont Blanc. Our group spread out and most of us had to take a little pause now and again in the thin air. By 1330, after just 3 hours walking, I was at high camp, and Gerwyn had joined Rob and I in our little home. We explain, tongue in cheek all our little rules and foibles, but Gerwyn is easily able to fit in with our curious ways as we looked forward to a restless night. The walk up had been really enjoyable, and there were a few deep crevaces towards the top of the day’s route. But that was nothing compared to the superb location of the high camp. 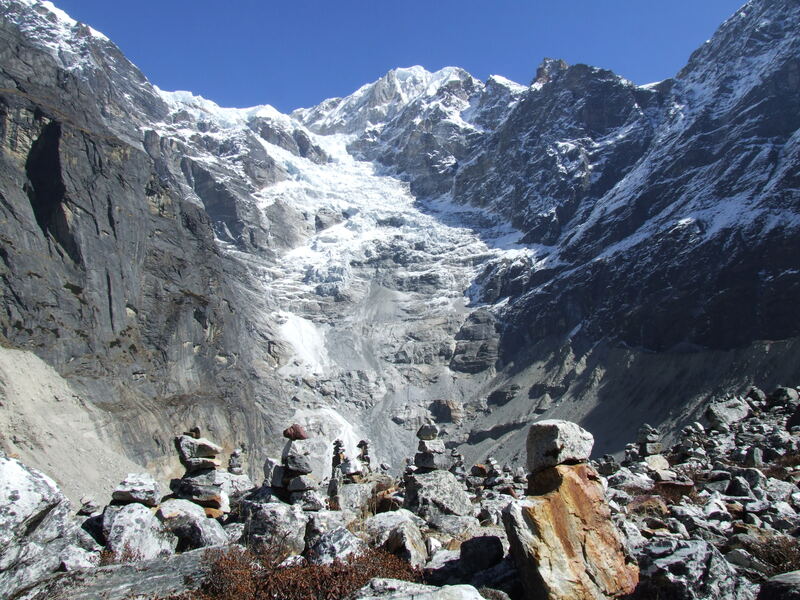 You drop off the glacier onto boulders and scree, just behind the lee of a huge rock outcrop. It’s bordered on the far side by a huge cliff that drops several hundred unhindered metres to the valley floor below. It’s definitely somewhere where you need to take your head torch for night time toilet visits. Incidentally, there is now a good rule that all human waste has to be carried out of the park. Easily said, but not so easy to do. Try taking a dump in a bin bag whilst trying to keep your salopettes off the floor. Do it in you back garden, then imagine what it’s like when it’s freezing cold, you are at 5,800 metres altitude, and there’s a fatal fall cliff about 3 metres away from you. It’s not so much character building as character revealing if you ask me! We had our first views of Mount Everest today, and although it was often obscured by cloud, it was still a little bit special. With tomorrow’s early start, we all anticipated getting some great views before the clouds come in. But now, we try and get as much rest as we can, interspersed with pints of tea to keep the fluid levels going. It’s going to be a long evening, but a short night and then a loooooong day. This is it, Summit Day? The question mark is deliberate as it’s never a done deal. We had all snoozed at some point or other during the night, but we had all been awake at various times as well. It wasn’t a good nights’ sleep! Our wake-up call came at 0200 hours, and it was both welcome and dreaded. Welcome as we were going to do what we’d come to do, but dreaded as I was tired and cold. As bad as the night was, it was still a chance to get some short term oblivion. “Focus Nigel” I say to myself, “…you know you will enjoy it when you get going. Just push through this nonsense for the next hour or so”. The cuppa was as always, very welcome, but none of us enjoyed the breakfast. I forced mine down, but the others barely scratched the surface with theirs. We left camp a little bit late, under a clear starlight and cold night. 0330 and we were off. There were 6 clients on our rope, with Dawa Tashi leading and Tenzee following on at the end. It was the Island Boys with both Tent Mates. On the next rope were the Wilson Boys, and following up at the end, with her own personal guide was Gillian. At first, the going was okay; very cold, but firm neve with a slightly raised path due to the previous freezing of footprints. Sastrugi had formed around the path and where your torch shone was the edge of the world as far you were concerned. After the first hour or so, I thought to myself, “Yep, I can do this for a few more hours yet. This is looking good”. Gerwyn decided to change his jacket and to do so took off his mitts. It was so cold that soon he was in a bit of trouble and had lost feeling in his right hand. He’s a very experienced climber and knew better than to keep quiet about it. Dawa Tashi came and massaged his hand whilst I came alongside him and bear hugged him to share a bit of my body warmth. Well, that was my excuse anyway! It wasn’t long after that when the firm snow turned to softer powder. The ground had steepened and the going was a lot harder. We slowed down quite perceptibly I think. When the sun came up, I looked back the way we had come and to my dismay, the last camp seemed to be right on our doorstep. We’d been steadily walking upwards for 2 ½ hours, yet we’d hardly seemed to move any distance at all. We were all struggling a little in our own ways, and I began to think we would be turned around before we reached the summit. The guys at the front of the rope were doing a great job of breaking trail and we all realised they had it hardest. One poor soul was forced to stop, drop his trousers and dig a hole in full view of everyone else. But we were a single unit now. Either all 8 of us would get up there or none of us. We stayed tight knit and everyone took their turn in encouraging the others. This shot was taken from about 6,300m on the slopes of Mera Peak. A stunning view of the highest mountains in the world behind us. We settled down into a more considered but stable rhythm, and after a while conditions got better underfoot. I was delighted when the summit cone came into view and Dawa Tashi had enough confidence to publicly announce we had plenty of time left and there was nothing to stop us making the summit. That gave everyone the morale boost it was probably designed for, and after negotiating a few more crevaces, there we were, sitting below the final headwall. I was the first client up the fixed rope and boy! The stupendous views were worth every calorie of effort. A little bit of cloud obscured the top of Everest but it looked great all the same. 9 out of 10 clients gathered at the top and the first of us were only 30 minutes slower than we had planned for. It had taken us 5 hours to get here and as we all know, the top is only half way. But I knew the descent would be easier than earlier on the way up. Yes, we would be a bit tired, and yes, the euphoria would be subsiding, but every step would be gravity assisted and the air would become imperceptibly thicker the further we went. We stayed roped up until we were back at high camp. A quick lunch and much appreciated tea, and then on down to the edge of the Hongu Valley. By now it was clouding over again and there were a few patches on the upper glacier when it had been approaching white out conditions. It was good to get back down to the edge of the Hongu valley with the summit under our belts, but bittersweet as our good friends were now breaking off to continue their trip to Island Peak. A full 11 hours after we had started out from high camp, we trod our way into Khare for another night in a place that now almost seemed like home! Today was an easy 2 hour walk downhill over the glacial meadows, the broken moraine rubble, and into Tagnag. Of course, the afternoon clouded over and there was a bit of snow. It got really quite cold and thoughts began to turn to hot showers, sun and swimming pools. We had another leisurely day with 3 hours taking us all the way back to Khote. Our route was slightly different in that we stayed right down by the river rather than the shelf of meadow just above it. There were pretty views around us, but we’d seen them before. Still, it was nice being down by the river, picking your way between boulders and seeing some awesome looking plunge pools. Back in Khote we camped again on the village square and this time knew how good the stove was going to be. It didn’t disappoint! We even had Buffalo burgers again, equally as good as the first time. I had showered, was wearing clean underwear; I was warm and full of food. It felt good! Today was to be the last long day of the trip. We were on the road by 0730 and the walking was really enjoyable. We followed the same path down us we used on the way up, but then turned sharply uphill until we reach the mountain village of Zatrwa. The path had returned to forests of juniper, rhododendron and bamboo. It meandered alongside the river at first, then romped uphill and across a few mountain passes. Again as we got to the high ground, it reminded me of North Wales or Scotland. Except, of course, for the distant views of mountains and valleys marching down in seemingly endless rows. We passed some big chortens that marked the pass entrance and each was bedecked with prayer flags. 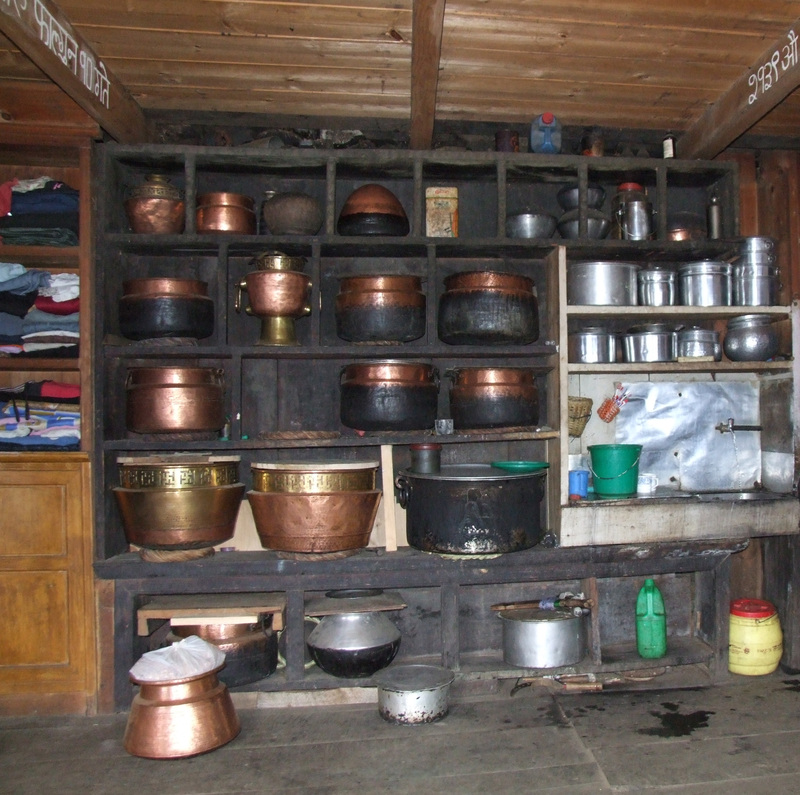 We finally climbed to the head of the col and found ourselves at Zatrwa, a collection of huts and cookhouses that sits astride the main route between Lukla and the Hinku valley. It wasn’t too long until the stove was warming up and we were contemplating our last days walking ahead of us. A bitterly cold morning greeted us and stayed that way until the sun came over the horizon. Old ice and snow was lying in the corners where ever the sun couldn’t directly penetrate the shadows. The route from the campsite took us directly up an obvious path past another large chorten. From the col, this looks like the entrance to the pass, but actually it is one of several false summits you pass on the way. There is no mistaking the pass when you get there though. You drop over the lip in the gap between some small peaks and immediately you are back onto snow and ice. 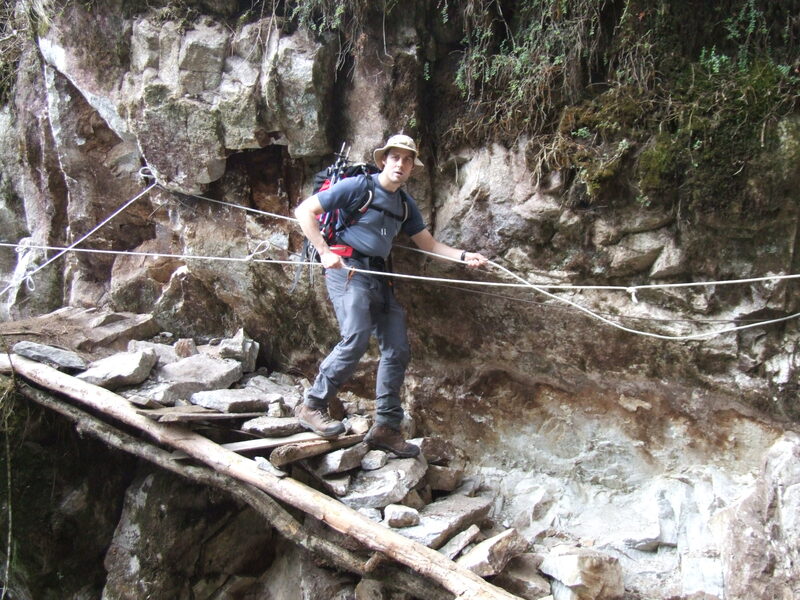 The first few steps were steep and treacherously slippery. The path soon eased off, but a fall would see you go a long way on 35 degree snow and ice. Far below us was the path we had taken on day 2 of the trek and we were able to pick out the route we had taken. The path through the snow contoured across the high flank and then began to rise up to another gap in the mountains. We moved up easily to this point and were able to look down toward the peaks sitting across the valley from Lukla. Below us though, was the final difficulty. 50 degree snow with icy bucket steps in it. It had a hard crust and again, a fall would have taken you a long way, and whilst you may have survived it, you’d be in some trouble! Tenzee set up a safety rope and off we dropped. It was best taken used as a hand rail whilst facing forward. The whole 50 metres was used and while the angle lessened a little when the rope ran out, it was still bloody steep! Fairly soon though, the path took a far less direct line and began to meander across the face of the slope and so was much less steep. Eventually the snow became patchy and it wasn’t long until we were in Kharka Teng. This was a good place to stop for a quick cuppa whilst the others caught up, and then we followed a pebble strewn path through the thickets until we reached the next set of teahouses. We were definitely back into civilisation now and in fact had got our first glimpses of Lukla as we had descended. We took a quick lunch as the weather tried to get nasty on us, but for our last hour or so, we romped into Lukla with strong sun shining down on us like the righteous! So what was the end result of this trip? Well, I’d summited my first 6,000 metre plus peak. I had some fantastic memories, some great pictures and lost a few kilos in weight. But most of all, I reaffirmed my deeply held view that the mountains are a magical place to be, where real lasting friendships can be forged.